Holli Clepper has a B.S. in physical education from Texas A & M, and has been a personal trainer, group fitness instructor and educator in the fitness industry for over 25 years. 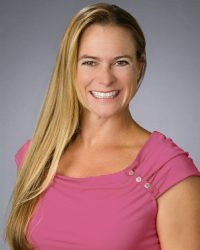 She is the owner of In Health and Happiness, a fitness education company in San Diego, CA and author of Prenatal Health and Happiness Through Exercise and Nutrition, Postpartum Health and Happiness Through Exercise and Nutrition and Pass The ACE Personal Trainer Exam. She has taught and trained at a variety of gyms from the YMCA, to the C.H.E.K Performance Studio. She has held Directorial and Instructional positions in leading health and fitness companies such as the American Council on Exercise, The C.H.E.K Institute, Exercise Etc., The YMCA, IDEA World, and the University of California San Diego Extension Program.